A heartbreaking affair, an unsolved murder, an explosive romance: welcome to summer on the Cape in this powerful debut. Seven summers ago, Marcella Atkinson fell in love with Cecil McClatchey, a married father of two. But on the same night their romance abruptly ended, Cecil's wife was found murdered—and their lives changed forever. The case was never solved, and Cecil died soon after, an uncharged suspect. Now divorced and estranged from her only daughter, Marcella lives alone, mired in grief and guilt. Meanwhile, Cecil's grown son, Jed, returns to the Cape with his sister for the first time in years. One day he finds a woman's bathing suit buried in a closet—a relic, unbeknownst to him, of his father's affair—and, on a hunch, confronts Marcella. When they fall into an affair of their own, their passion temporarily masks the pain of the past, but also leads to crises and revelations they never could have imagined. In what is sure to be the debut of the season, The Swimming Pool delivers a sensuous narrative of such force and depth that you won't be able to put it down. HOLLY LECRAW lives outside of Boston with her husband and three children. Her short fiction has appeared in various publications and has been nominated for a Pushcart Prize. 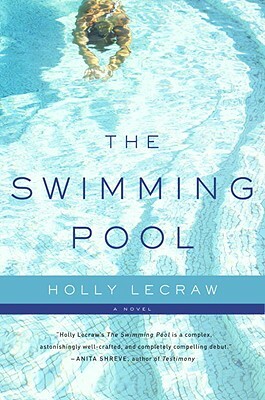 "Holly LeCraw's THE SWIMMING POOL is a complex, astonishingly well-crafted, and completely compelling debut." "THE SWIMMING POOL is more than an auspicious debut. Holly Lecraw's first novel is gripping, passionate, and beautifully written from start to finish, a moving chronicle of two damaged families struggling to free themselves from a complex web of secrets and lies." "THE SWIMMING POOL is as riveting and psychologically complex as Hitchcockian film noir. LeCraw displays perceptiveness and intelligence in weaving together a tale of entangled lies, complicity, betrayals, and unstoppable consequences." "THE SWIMMING POOL is a riveting family story that will hold the reader enthralled from the very first page. With great suspense, Holly LeCraw skillfully orchestrates the collision course of a present-day love affair with the dark mysteries of a family’s past. She is a wonderful writer." What sort of man should Marcella have married? How might her life have been different--or would it have been? What sort of woman should Anthony have married? Or did they marry the right people after all?